Ka-50 has small mid-mounted wings, fitted with four underwing suspension units and wingtip countermeasures pods. Ka-50 is fitted with four underwing suspension units and wingtip countermeasures pods. 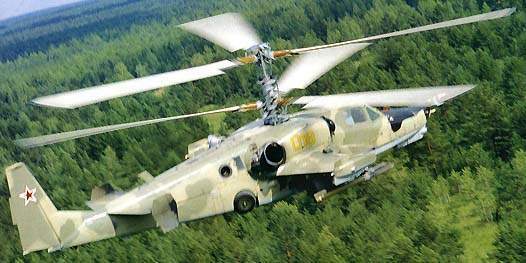 The Ka-50 entered service in the Russian Army in 1995. 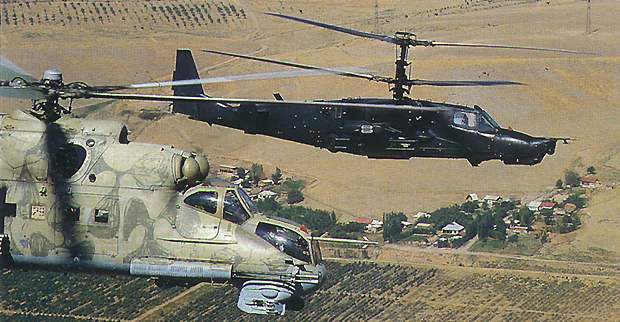 A Ka-50 Black Shark escorting an Mi-24 helicopter. Ka-50 Black Shark attack helicopter on patrol. The coaxial rotor design provides a hovering ceiling of 4,000m. Maximum combat weapon load of 2t is selected according to combat mission. The single-seater Ka-50 Black Shark (shown) has led to the two-seater Alligator combat helicopter. The Ka-52, the two-seater version of the Ka-50. 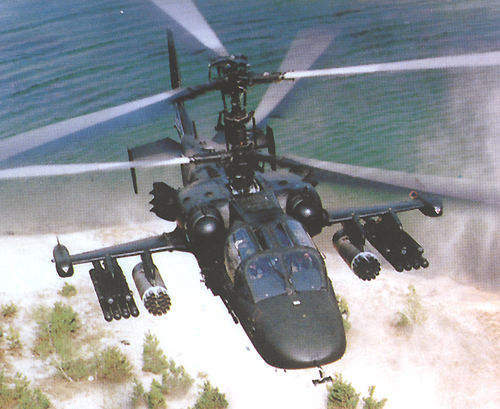 The Russian Ka-50 Black Shark attack helicopter. The Ka-50 Black Shark helicopter, developed by Kamov Helicopters JSC, carries the Nato codename Hokum A, with Hokum B the two-seat version, Ka-52. 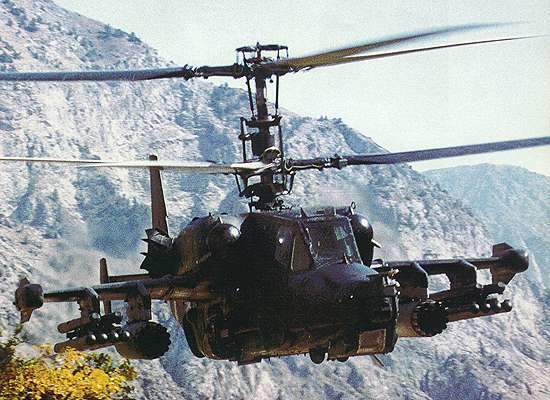 Ka-50 is also known as Werewolf. It is a high-performance combat helicopter with day and night capability, high survivability and fire power to defeat air targets and heavily armoured tanks armed with air defence weapons. It entered service with the Russian Army during 1995 and is manufactured at the Sazykin Aviation Company Progress based in Arseniev Maritime Territory, Russia. A night attack version, Ka-50N, with Samshit-50T thermal imager, day TV and laser rangefinder has been developed, and Kamov has also joined with Israeli Aircraft Industries (IAI) to produce a version, the Ka-50-2 Erdogan that is compatible with Nato weapons and has an Israeli equipped cockpit. The coaxial rotor design provides a hovering ceiling of 4,000m and vertical rate of climb of 10m a second at an altitude of 2,500m. The rotor blades are made from polymer materials. The coaxial-rotor configuration results in moments of inertia values relative to vertical and lateral axes between 1.5 to two times less than the values found in single-rotor helicopters with tail rotors. Absence of the tail rotor enables the helicopter to perform flat turns within the entire flight speed range. A maximum vertical g-load of 3.5 combined with low moments of inertia give the Ka-50 a high level of agility. "The Ka-50 helicopter is a high performance combat helicopter with day and night capability." Extensive all-round armour installed in the cockpit protects the pilot against 12.7mm armour-piercing bullets and 23mm projectile fragments. The rotor blades are rated to withstand several hits of ground-based automatic weapons. The Ka-50 is the world’s first operational helicopter with a rescue ejection system, which allows the pilot to escape at all altitudes and speeds. The K-37-800 rocket-assisted ejection system is manufactured by the Zvezda Research and Production Enterprise Joint Stock Company in the Moscow region. A request for proposal (RFP) to buy 22 attack helicopters was issued by the Indian Defence Ministry on 30 May 2008 as part of the $550m contract. The request determnined the attack helicopter should encompass weapons to boost the Indian Air Force’s surveillance and combat capabilities. The air force also required that the helicopter would weigh 2,500kg or more when empty and have two engines. It should encompass a modern anti-armour capability along with a turret gun of 20mm or higher calibre and be able to fire 70mm rockets a range of 1.2km. The helicopter should be capable of working in all weather, day and night, and in desert and mountaineous regions. The second RFP was issued in June 2009, stating that around 384 additional light helicopters were cleared for purchase. The $2bn order was for the Indian Air Force and Army, of which 125 would be for the air force and 259 for the army. A combination of various armaments to a maximum weapon load of 2t can be selected according to the mission, including anti-tank missiles, unguided aerial rockets of different calibres, air-to-air missiles, guns, bombs and other weapons. The helicopter has small mid-mounted wings, fitted with four underwing suspension units and wingtip countermeasures pods. Up to 12 Vikhr supersonic anti-tank missiles can be mounted on the helicopter’s two underwing external stores. The laserbeam-riding Vikhr missile is stated as having a target hit probability close to one, against a tank at a range of up to 8km, and the capability of penetrating all types of armour, including active armour up to 900mm thick. 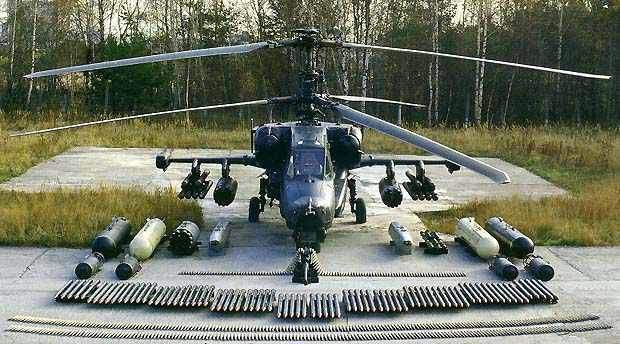 "The Ka-50 Black Shark is armed with a 2A42 quick-firing 30mm gun." 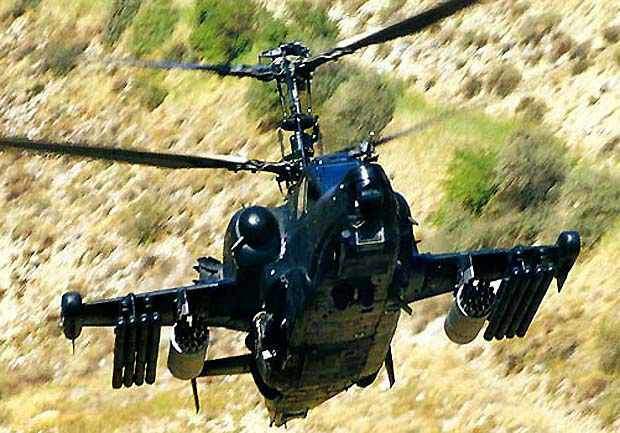 The Ka-50 is armed with a 2A42 quick-firing 30mm gun, which has an unrestricted azimuth and elevation range mounting for use against airborne or ground targets. The gun is equipped with 460 rounds of ammunition: two types being carried, high-fragmentation and explosive incendiary rounds and armour-piercing rounds. The pilot selects the type of ammunition in flight. The weight of the ammunition is 0.39kg each round, the muzzle velocity is 980m/s and the range is up to 4km. The gun provides an angular firing accuracy of two to 4mrad. Flight systems include inertial navigation system (INS), autopilot and head-up display (HUD). Sensors include forward-looking infrared (FLIR) and terrain-following radar. The Ka-50 is fitted with a radar warning receiver, electronic warfare system and chaff and flare dispenser. The Ka-50 attack helicopter can climb at a rate of 16m/s. It can fly at a maximum speed of 390km/h. The maximum range and service ceiling of the helicopter are 1,180km and 5,500m respectively. It can fly at a cruise speed of 270km/h. The combat radius and disc loading of the helicopter are 460km and 30kg/m² respectively. The endurance of the helicopter is three hours. The helicopter weighs around 7,800kg and the maximum take-off weight is 10,800kg.